When I contemplate cleaning up the environment, I hope my efforts will not only make it look more inviting and attractive, but that I’ll leave it in a state that sustains the life that is present and nurtures new growth. Then, rather than being something I ‘tick off’ on my list of things to do, it becomes a creative and rewarding task. Promoting health and wellbeing can also be a creative and life-giving experience. 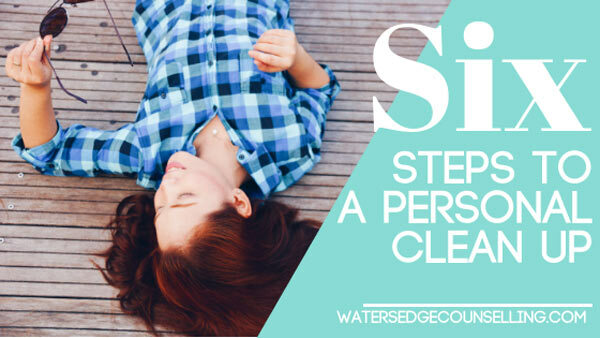 When thinking about embarking on ‘personal clean up’, don’t feel you have to throw out the old model; instead choose to build upon what you already have and who you already are. Develop your strengths, resources and achievements. Take the mindset of ‘I am always growing into my full potential’ and notice what that feels like. Ask yourself, ‘What one thing can I do to improve my health and wellbeing?’ It’s a freeing experience to explore ways to enhance your experience of health and wellbeing. You could choose something physical, emotional, psychological or spiritual. It could be something relatively small, such as taking a vitamin supplement recommended by your doctor or going to bed earlier on a regular basis. You might choose to do something you’ve been thinking about trying for a while, such as joining a Pilates group, studying or attending your local church. Clean up any messy or disorganised spaces in your home. The external space we inhabit often reflects our inner space. When you look at your living spaces, what message do they have for you? Are these working, living and leisure spaces organised and free of clutter, or do they feel disorganised and overwhelming? A small clean-up of your external living spaces can create and/or free up more inner space, allowing a greater sense of control and movement. Develop a daily spiritual practice. Prayer, meditation, contemplation and reflection are ways of developing an inner path that lead to the deeper discovery of the presence of God in our daily lives. For centuries, men and women have used these practices as to find a deeper sense of meaning and purpose in their lives. Try putting aside at least 10 minutes a day to connect with your inner self. Whether you sit quietly, journal your thoughts, do a walking mediation or express yourself though a medium such as art, this space has the potential to become the wellspring from which other changes can emerge. Attend to any relationships where you have ‘wronged’ the other. Relationships are tricky at the best of times, but when we neglect to take responsibility for hurts, intentional and unintentional, toward another person, we hurt ourselves the most. Withholding an apology, harbouring contempt and dwelling on past hurts drain our energies and rob us of joy. Have you noticed how you talk to yourself? Do you encourage yourself? Do you forgive yourself for stuffing up or are you more likely to criticise yourself? The way we talk to ourselves either builds and nurtures our sense of self or destroys it. Choose to be kind to yourself. And, finally, any change we make is often challenging to sustain. Having a friend who is willing to go on this journey with you brings accountability, encouragement and renewed energy for the task. Do you need a personal clean up? Would you like support to rejuvenate your wellbeing and life? Here’s what you need to do: Contact Colleen on 0434 337 245 or Duncan on 0434 331 243 for a FREE 10 minute consultation on how we can best help you or book online.